February 11, 2014—Within three years of being released from jail, two out of every three inmates in the US wind up behind bars again—a problem that contributes to the highest incarceration rate of any country in the world. New research suggests that the degree to which inmates’ express guilt or shame may provide an indicator of how likely they are to re-offend. The findings show that inmates who feel guilt about specific behaviors are more likely to stay out of jail later on, whereas those that are inclined to feel shame about the self might not. This research is published in Psychological Science, a journal of the Association for Psychological Science. 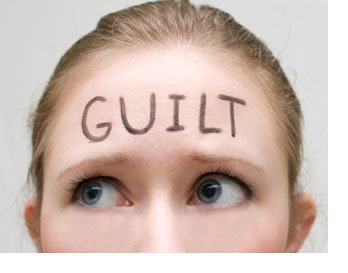 The difference between guilt and shame might seem subtle, but researcher June Tangney and her colleagues Jeffrey Stuewig and Andres Martinez of George Mason University hypothesized that feeling one or the other of these emotions might contribute to different outcomes for incarcerated individuals. Feelings of shame, on the other hand, involve a painful feeling directed toward the self. For some people, feelings of shame lead to a defensive response, a denial of responsibility, and a need to blame other—a process that can lead to aggression. Tangney and her colleagues interviewed over 470 inmates, asking them about their feelings of guilt, shame, and externalization of blame soon after they were incarcerated. The researchers followed up with 332 of the offenders a year after they had been released, this time asking them whether they had been arrested again and whether they had committed a crime but had not been caught. They also compared the self-reported data to official arrest records. Overall, expressions of guilt and shame were associated with recidivism rates, but in different ways. “Proneness to guilt predicts less recidivism—a lower likelihood of re-offense,” Tangney says. That is, the more inclined an inmate is to feel guilt, the less likely he or she is to re-offend. The implications of proneness to shame, on the other hand, were more complex. Inmates inclined to feel shame, and who were also defensive and blameful of others, were more likely to slip back into crime. Inmates who were shameful but who didn’t blame others were less likely to end up in jail again. These findings suggest that there may be “two faces” of shame—one that increases recidivism and one that does just the opposite. The researchers believe this work opens up doors for evaluating other aspects of restorative justice, and they plan to investigate the links between guilt, shame, and other post-release outcomes, including substance abuse, mental health issues, and readjustment into their communities.